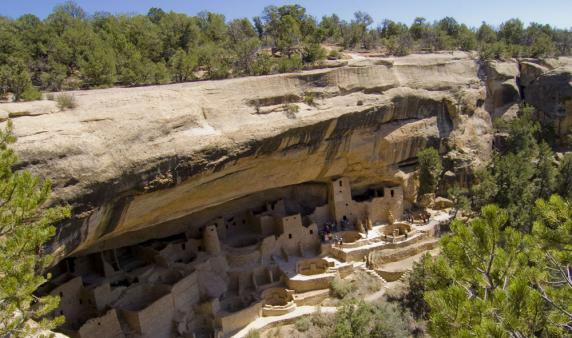 One of the richest archeological zones in America just happens to be hidden amid some of the grandest scenery in the Southwest — the pale cliffs and scrubby flats in and around Colorado's Mesa Verde National Park. Make your home base in the town of Cortez, just an hour from Mesa Verde National Park. Cortez offers a host of excellent accommodations, dining and shopping opportunities, as well as 294 acres of parks, several recreation areas and an abundance of activities. Stop by the Colorado Welcome Center on Main Street to pick up the National Geographic Four Corners Region map, which gives local insights into what the area has to offer. Then head to the "green table" of Mesa Verde National Park, home to more than 4,000 archeological sites, 600 of which are cliff dwellings. Orient yourself at the Mesa Verde Visitor and Research Center, where you can pick up maps and brochures and purchase tickets for tours. Only two cliff dwellings are open for self-guided tours. These fill up quickly, so if you want to go inside the amazing Cliff Palace, you must nab a spot on a guided tour early. On your way to Cliff Palace or Balcony House, enjoy the scenic drive on the Cliff Palace/Balcony House Loop Road. Or if you purchased tickets for Long House, take the Wetherill Mesa Drive, where picturesque trails lead to mesa-top ruins and spectacular overlooks of cliff dwellings. Back in Cortez, swing into the Ute Mountain Indian Trading Company for pottery, jewelry and other handmade treasures. Sample local wines from Guy Drew Vineyards and Sutcliffe Vineyards and watch artists create their work. Now that you have a solid appreciation of the canyons and cliffs that made Mesa Verde Country famous, take a drive on one of Colorado's most fascinating scenic byways. The San Juan Skyway is a 236-mile loop called the "most beautiful drive in America" for good reason. The road tours around southwestern Colorado's rich landscape, starting in Cortez and passing through the idyllic mountain towns of Mancos, Durango, Silverton, Ouray, Ridgway, Telluride, Rico and Dolores. Alternatively, you could travel the 116-mile Trail of the Ancients, America's only National Scenic Byway dedicated solely to archaeology. From Cortez, wind past Mesa Verde National Park to Ute Mountain Tribal Park, where Ute guides help you explore the culture, architecture and art of the Ute and Ancestral Puebloan people. And there's the new Tracks Across Borders byway, which follows the creation and development of the Denver & Rio Grande Railroad, the nation’s largest, narrow-gauge railroad system. The byway starts south and east from Durango. From here, pass Four Corners Monument (where the borders of Colorado, New Mexico, Arizona and Utah meet) on your way to Hovenweep National Monument, famous for its round and square towers, some of which are easily accessible via short hiking trails. Year-round, stop at Ute Mountain Casino in Towaoc, south of Cortez, for a chance to line your pockets with glittering gold. Or take advantage of Cortez’s growing status as a hub for mountain bikers. The area’s high desert, canyons, mesas and mountain trails bring opportunities for year-round rides. East of town on Hwy. 160, Phil’s World is a fast and fun singletrack trail maintained by a local bike club, and the Geer Park opened recently with 10.9 additional miles of intermediate biking within Cortez city limits. If ATVs are your thing, the Dolores Public Lands Office can get you on the trails, including the Aspen Loop Trail, a multipurpose, 39-mile loop trail constructed by San Juan National Forest and the Four Corners Trail Club. Travel through old logging roads, streams, aspen groves and spruce forests. In Dolores, fishers will find haven on McPhee Reservoir and the Dolores River, a popular whitewater rafting route that runs through town. McPhee is the second largest body of water in Colorado, with 50 miles of shoreline in pinyon, juniper and sagebrush country. Doc Marina's offers boats and kayak rentals, snacks, ice and tackle. End the day at Dolores River Brewery for local suds and wood-fired pizza or Sutcliffe Vineyards west of Cortez, recently recognized among the country’s top wine producers by Food & Wine Magazine. The Ancestral Puebloans farmed this area as far back as 600 AD, and the fruit-heavy orchards and sunflower fields stretching far into the horizon are proof of the land's fertility. Breweries and wineries, too, stomp out unique vintages here. Depending on the season, stop by a farmers' market to stock up on fresh local fruit, vegetables, meat and honey. Or get hands-on at a U-pick apple, peach or pear orchard. Tour a craft brewery, winery or distillery, and round out your day with dinner at a restaurant that specializes in local foods. You might also want to fit in a visit to the Canyons of the Ancients National Monument. Stop first at the Anasazi Heritage Center, a superb archeological museum that provides an introduction to the monument, as well as to the cultures native to the region. Now you’re ready to head to Lowry Pueblo. This ancient pueblo site within the monument features 40 rooms and eight circular kivas, including a great kiva. Or head to Mancos, named one of the Best Small Towns to Visit in 2016 by Smithsonian Magazine, a community that traces its roots back to the ranching, farming and timber industries that started back in the 1870s. Today Mancos, recently named a Certified Colorado Creative District, boasts little shops that brim with unique gifts and wonderful art. Local artisans craft everything from beer and rum to leather goods and handmade Western hats. Or consider Towaoc, the state’s most southwestern town, Towaoc is also the headquarters of the Ute Mountain Ute Indian Reservation. Area attractions include the Ute Mountain Tribal Park, which features both Ancestral Puebloan and Ute rock art and dwellings, as well as native guides that lead guests on an interpretive journey through Ute and Ancestral Puebloan history. The tribe also operates a casino, hotel, RV park, campground, travel center and restaurant. From Denver, Cortez is about seven-and-a-half hours via U.S. Hwys. 285 and 160. Mesa Verde National Park is one hour from Cortez, via Hwy. 160.